It is really amazing how busy your household can get when the kids are done school. I have 2 teenage boys that have a lot of friends and we seem to be the place to hang out. Don't get me wrong, I love that I get the chance to meet everyone and know where my boys are, but it sure can get crazy. Sometimes the only thing to do is run to my craft room and escape the chaos. It is Wednesday, so that mean another reveal for The Cutting Cafe. 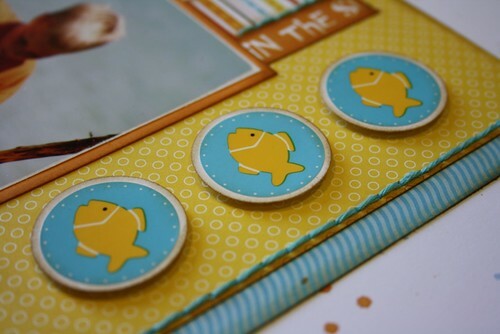 This week I played with Under The Sea, which is a printable stamp set. 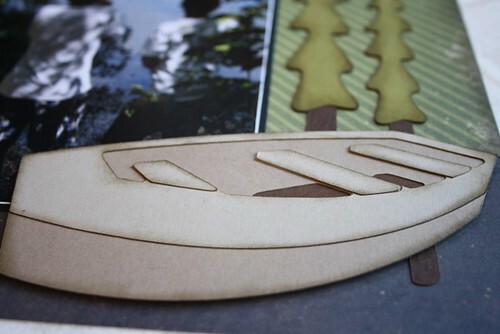 I decided to import my image to my Silhouette and use the 'print & cut' feature and make my own die-cut for a layout. I also pulled out my Copic markers (don't look too closely......I haven't been practising). This fish was one of the many images that are available with this set. Isn't he adorable? 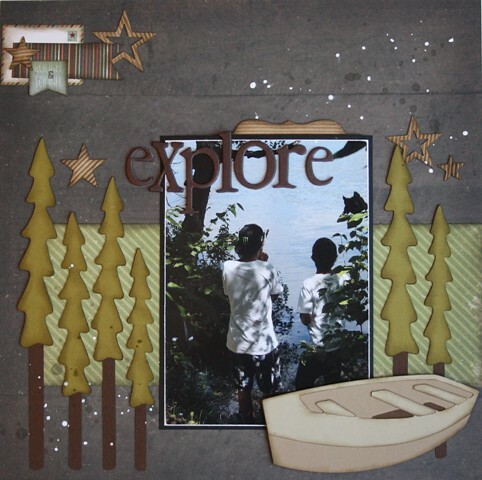 I love that I can have the Silhouette cut around the printed image and create a perfect border around the design. I found some matching stickers from SRM to embellish my page. I mounted them on punched circles and used foam adhesive to raise them up. There were even some fish in the exact colours that I needed. I could not resist adding some stitching to my layout. I used floss from We R Memory Keepers and my favourite template to poke the holes. I combined stickers and a title from my Silhouette to make my title. I splattered the background with some Mister Huey mists to add a bit of colour. There are so many different images that come with the Under The Sea set that it is going to be really interesting to see what all the ladies create this week. Be sure to visit The Cutting Cafe blog and check it out. The post will be up sometime today! Happy Wednesday everyone! It is going to be hot, hot, hot today. 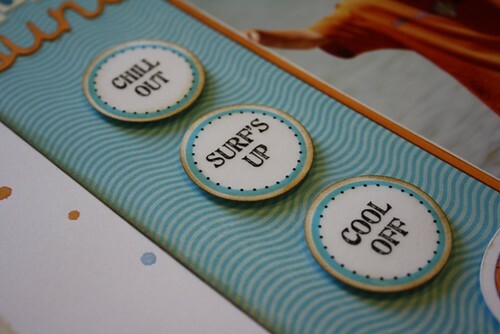 We are heading to the beach for the day to try and stay cool. This week at The Cutting Cafe I had the opportunity to play with Sweet Stuff Shaped Cards. I chose to use the popsicle for my design. I cut the card out, but only used the front and rather than making a shaped card, I used it as an element on a regular card. I added some stitching and a couple of Dewdrops to embellish. 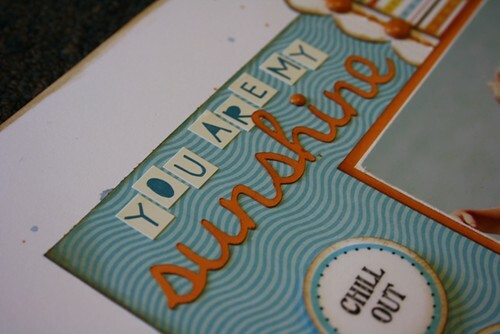 I found some rub-ons in my stash and used them for the sentiment and the heart border across the top of my card. I hope you stay cool today. 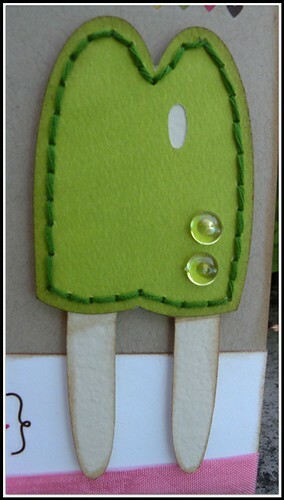 Be sure to visit The Cutting Cafe blog and see what the other ladies have designed this week. The post will be up sometime today. What an incredible challenge! The Inspiration Elevator girls have been working all month to create gorgeous and inspiring designs. Here`s the list of my friends and I hope you`ll pop by and see what they have created and perhaps take a moment to say a word or two. For my layout, I chose a photo of Jason and David standing next to Six Mile Lake. Were were camping there for a week and this was taken moments after we arrived at our camp-site. I tried to create a scene on my page that reflected the environment that we were surrounded by. Everywhere we looked there were trees and water. It was beautiful. Both Jason and David really enjoy the time that we spend on the water. I created this boat using an SVG file from SVG Cuts. 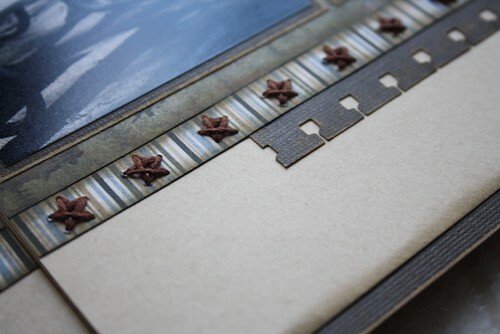 I love the rustic feel of my layout and to keep with the 'nature' theme, I die-cut some corrugated stars and scattered them on my page. 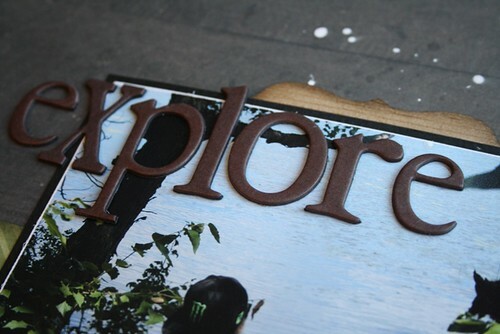 The title is created using chipboard alpha's and I adhered them right across my photo. My journaling is an important part of my page, and also this challenge. I chose to hide it behind the photo. 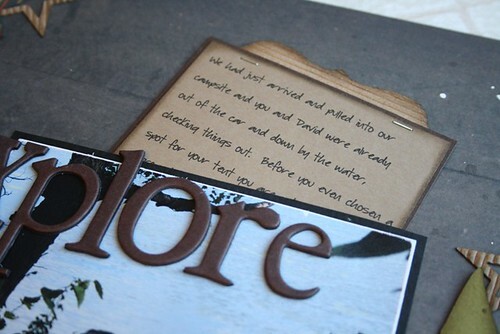 To reveal the journaling all you do is pull up on the tab, also made of corrugated cardboard. I am truly enjoying my creations for Inspiration Elevator. I hope you are trying some of these challenges too. I am a day late, but that is how my entire week is going. UGH! 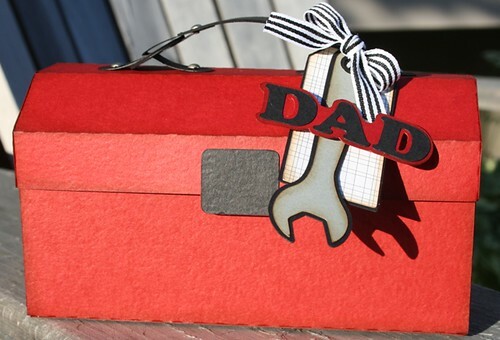 I am here today to show you the Father's Day cards I made using some files from The Cutting Cafe. 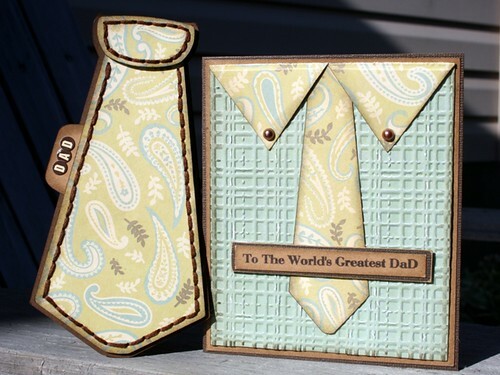 I used the Shirt & Tie Cutting file and created both of these cards. I used an embossing folder to add the texture to the shirt and I found this old paisley pattern paper that I thought would make a perfect tie. I added some pearls to the shirt and my sentiment across the front to finish it off. I also made the tie shaped card too. I couldn't resist adding some stitching around the edges to give it some dimension. 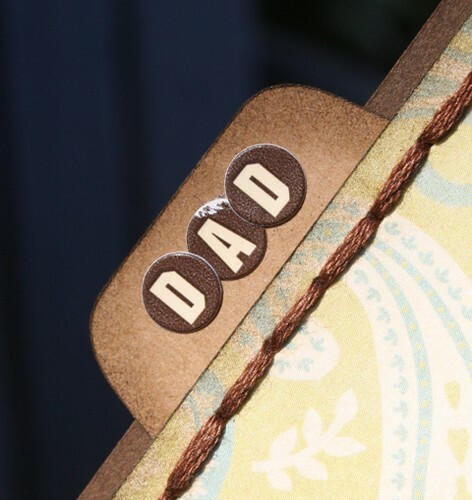 I added a tab to the side and embellished with letter stickers that say 'Dad'. 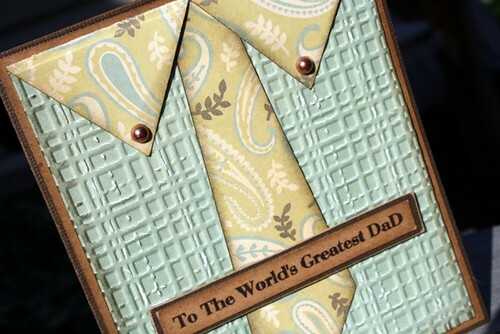 I have 2 fathers that will be happy to have one of these cards. I can't wait to give them. 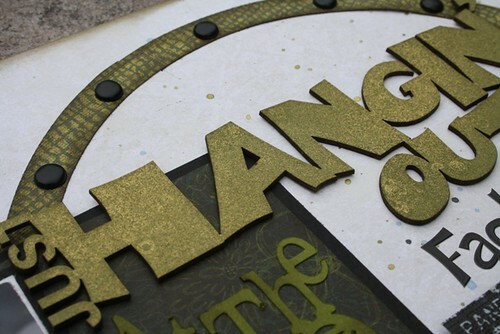 Be sure to visit The Cutting Cafe blog and see what the other ladies have created this week. The post is already up......just click here. 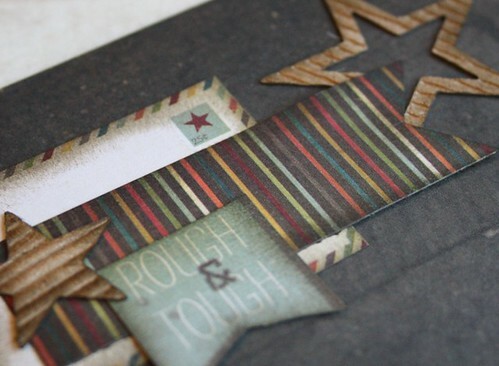 Two Scrapbook Friends Father's Day Blog Hop! 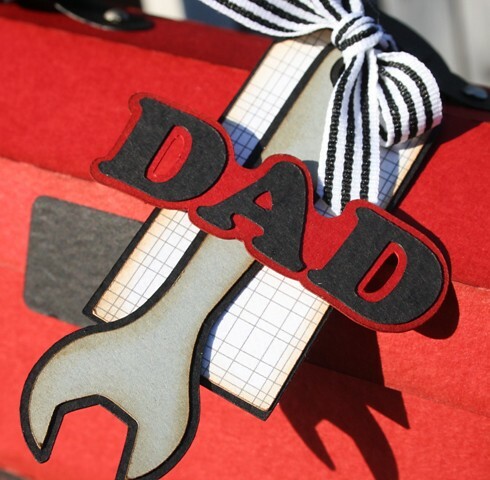 Welcome to the Two Scrapbook Friends Father's Day Blog Hop! 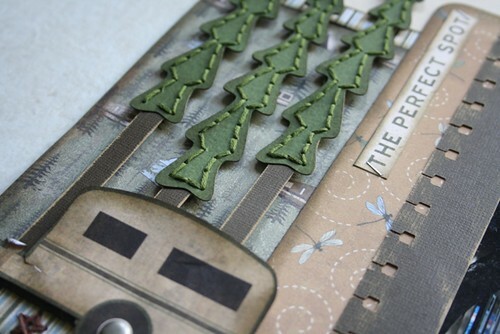 You should have started the hop at the Two Scrapbook Friends Blog and I am first up on the list! 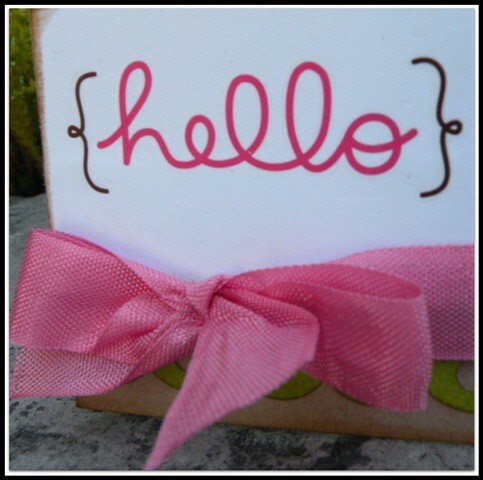 If you haven't checked in at Two Scrapbook Friends, click here to get all the details.....and I will see you again soon. 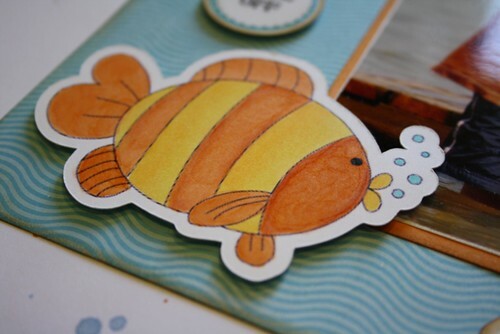 If you comment on each blog, you will qualify to be in a draw for a special prize from Two Scrapbook Friends! Also, you will find a RED HIGHLIGHTED word on each blog which will make a phrase at the end of the Blog Hop! 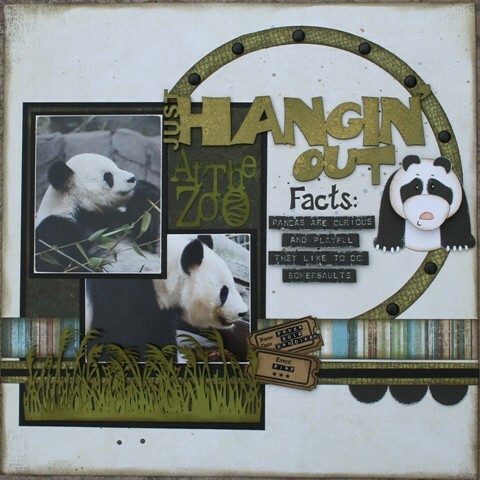 Once you have completed the hop to all our designers blogs, please leave a comment on the Two Scrapbook Friends blog. Then be sure to email the completed phrase to them for a second chance to win! 1. 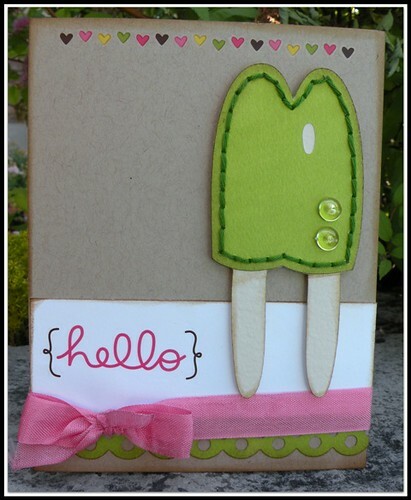 Leave a comment on all the blogs as you go and then come back to the Two Scrapbook Friends blog and leave a final comment there. For my project I couldn't resist making this adorable toolbox using an SVG file from SVG Cuts! It will be a perfect gift for my hubby from our children. 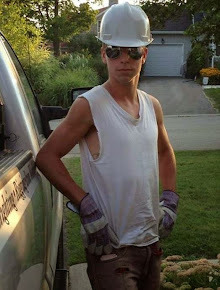 He is a mechanic and is always fiddling with something that requires tools, so it seemed like a good fit. The set even came with this tag that I attached to the handle of the toolbox. 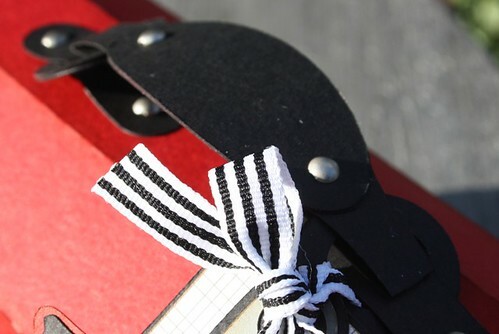 The hardware for my toolbox is so 'real looking', it is hard to believe that it is made of paper. Thanks for stopping by my blog and I hope you have fun hopping your way through the rest. 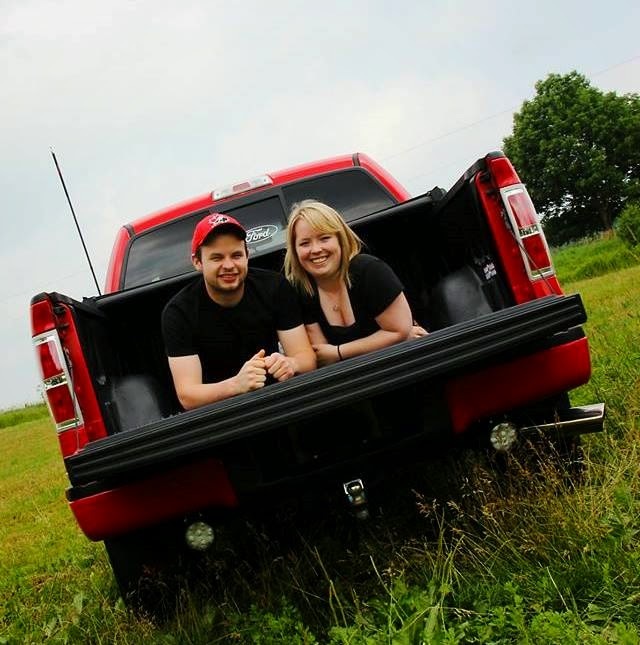 Be sure to leave a comment on all your stops, including Two Scrapbook Friends. Also don't forget to keep track of the highlighted words and email the phrase for an extra chance to win a prize. I am back with another great card that I made for The Cutting Cafe! 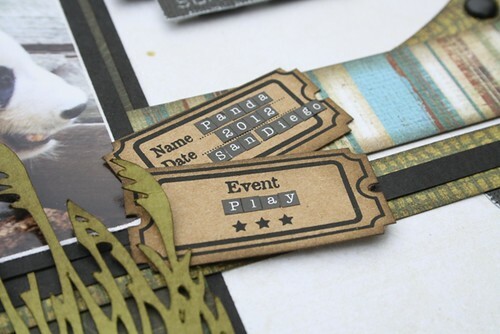 This week we used either the Pocket Shaped Card file or Pocket Full of Wishes printable stamp set. 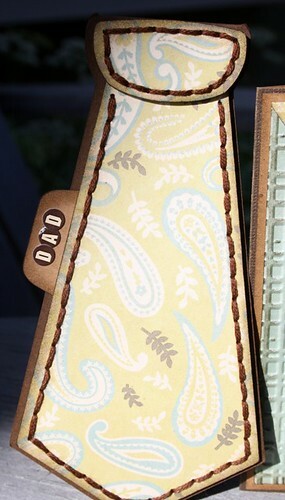 For my card, I used one of the assorted tops for the Pocket Shaped Card for the pocket on my card. 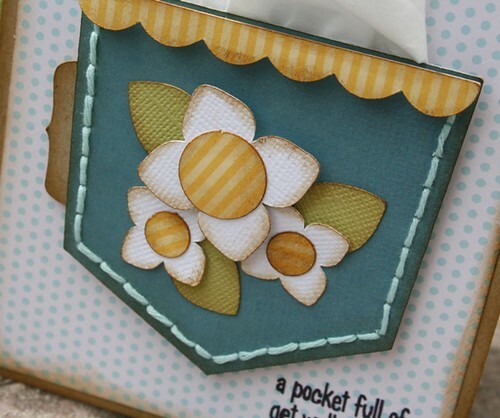 I added the flowers and the scalloped border from the misc. add-ons that come with it. I stitched around the edge of the pocket and added a little tab & some leaves (from my Silhouette). 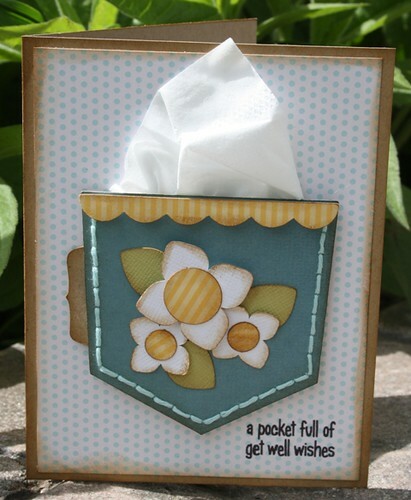 I used 'a pocket full of get well wishes' from the printable greetings and printed it right on my card background. I don't always have success with this, but I crossed my fingers and said a little prayer.......and it worked perfectly. 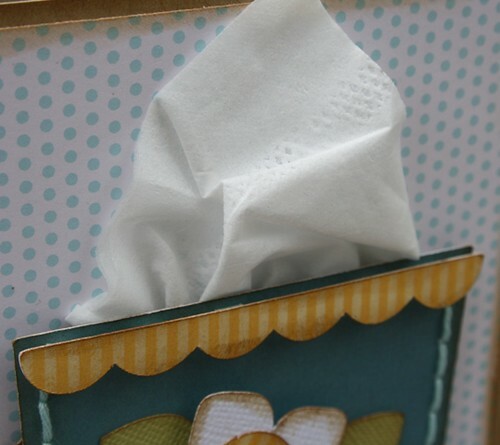 I added part of a tissue and stuffed it into the pocket (to go along with the sentiment). I just love how it turned out. I am really enjoying making cards. I am using up lots and lots of scraps too. Be sure to visit The Cutting Cafe Blog and see what the other ladies have come up with this week (the post will go up sometime today). I am sure it going to great. It was such a 'yucky weather' weekend, I managed to get a layout started and finished. That doesn't happen very often. Here is 'Happy Camper'! These photos were taken back in 2009 on a camping trip with my sister at Six Mile Lake. I broke out my Silhouette (big surprise there, huh?) 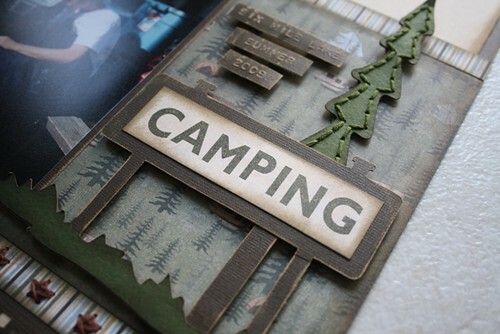 and made the base of the camping sign and the trees. I used my Dymo Label maker to do my journaling (love that little machine). I also used my Silhouette for my title. The lantern is cut from the paper that I was using (from The Paper Loft). 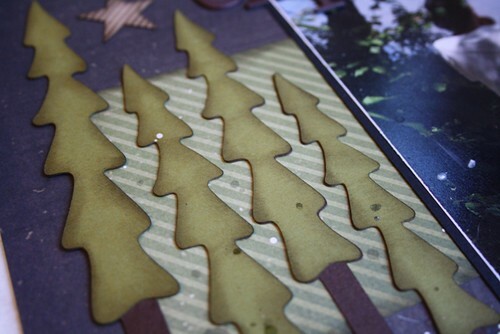 Here is another peek at those trees. I added some stitching to give them some dimension. I also stitched a border of starts along the striped border. Once I get the needle and thread out, I want to stitch everything. 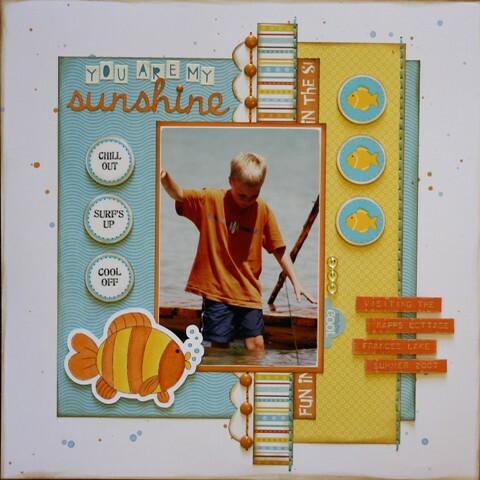 This will be a future kit at the store (Two Scrapbook Friends)! Watch your emails to let you know when it will be available. Happy Sunday to everyone! It hasn't been a very nice weekend here. We have had lots of rain and it turned much cooler than it has been. I have been spending more time indoors working on some layouts and reading. I have added 2 new books to my bookshelf (located along the right side of my blog). After finishing the 3 book Hunger Games series, I was looking for something less action packed to read. 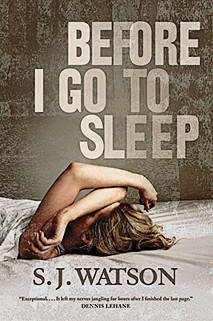 I really enjoyed reading Before I Go To Sleep by S.J. Watson. It is about a woman who was in a terrible car accident over 20 years ago and does not have the ability to form new memories. Each day she wakes up and does not remember anything that has happened. It is a great story and there is a nice twist at the end. I also heard that this book is going to be made into a movie and Nicole Kidman could possibly be the star. Then I moved on to read Daughters For A Time. This book is about a woman who tried for 4 years, without success, to have a baby. 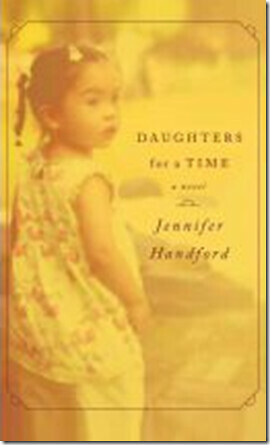 She ends up adopting a little girl from China......but there is much more. I don't want to spoil it, but I do recommend you read it. 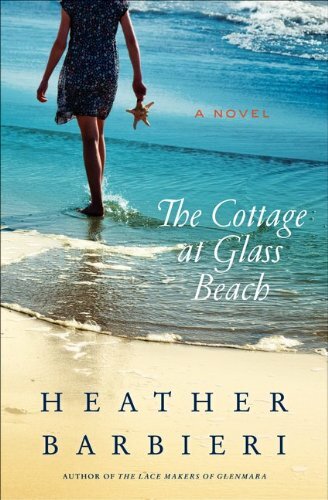 I have now started to read The Cottage At Glass Beach. This is about a woman who packs up her daughters and moves back to her childhood home after her politician husband is unfaithful. There is a bit of mystery involved so I am looking forward to diving in to this one. I am back with another layout for Jay's California trip album. I have already completed a 2-page layout about the Panda bears at the San Diego Zoo, but I still had 2 more photos that I wanted to include. I found this sketch and thought it would work perfectly for what I had in mind. 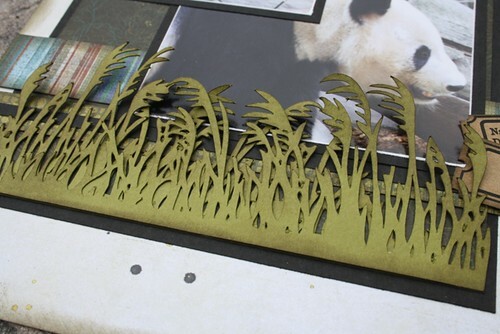 When I was creating the first layout (you can see it here), I found a file on the Silhouette online store for this grass. I thought it really resembled the bamboo so I downloaded it, but didn't end up using it. As it turns out, it worked perfectly on this page. I added in some tickets from Maya Road and used some incredibly tiny stickers (I had to get out my tweezers) to add some journaling. 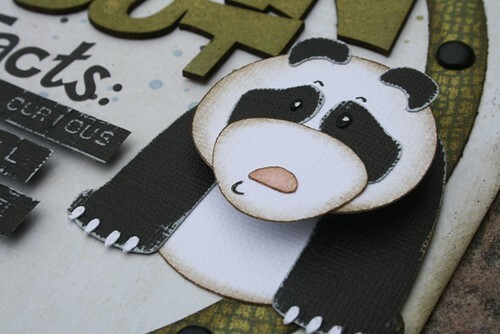 I wanted to include some fun facts about Panda bears so I pulled out my Dymo and Kraft Core cardstock and made my 'fact' strips. I used my Silhouette and created my own circle ring (pretty good huh?) and embellished it with black brads. 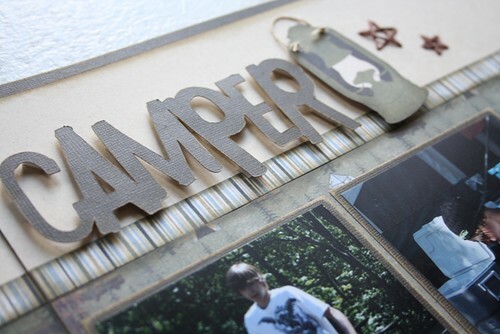 I found this chipboard title and misted it with some Tattered Angels Glimmer Mist. I also misted the background with 3 different colours of mist. On my practice sheet I did a lot more splattering and I should have done that here too, but I was a chicken.....oh well, next time. I just couldn't resist adding this sweet Panda from Silhouette. I added an Action Wobble to his head, so it interactive. That is the last of my Panda photos. We really enjoyed visiting them at the zoo. I have discovered that there is a Panda Cam that you can watch and see what they are up to throughout the day. I visit it often. You can check it out here!